Seattle, Wash., May 4, 2012 — When Holland America Line’s ms Oosterdam arrives at Seattle this Sunday, May 6, it will mark the beginning of the city’s summertime Alaska homeport cruise season. The line’s ms Westerdam arrives Saturday, May 12, and ms Amsterdam begins its roundtrip Alaska sailings from Seattle on Friday, May 18. In addition to the 52 roundtrip Seattle cruises this season, six South Pacific or Pacific Northwest cruises will either begin or end at Seattle, for a total of 58 calls and more than 104,000 guests. With three Seattle-based ships sailing out of the homeport for the five-month cruise season in 2011, Holland America Line contributed US$186 million to the Seattle economy and US$222 million across Washington State just from cruise ship calls alone. Factor in office and payroll costs for the 1,335 people the line employs locally at its headquarters, and its total economic impact rises to US$372 million in Seattle and US$526 million statewide. Indeed, for each port call by the 1,380-guest Amsterdam the line spends approximately $169,000 locally on provisions. For the 1,916-passenger Oosterdam and Westerdam, provisioning costs about $272,000 per week. Holland America Line works with 654 local vendors, from food and beverage suppliers to piano tuners, office supply stores and marine suppliers, among many more. 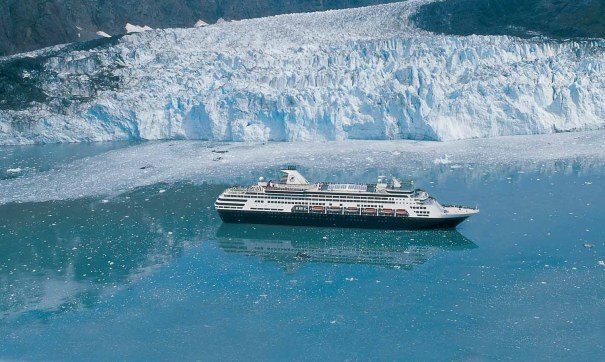 Holland America Line provisions each ship on “turnaround” dates. Provisioning a ship means bringing aboard all of the supplies and food products needed during a cruise. For example, Oosterdam requires some over 23,000 eggs and 1,375 gallons of milk each week — all coming from local farmers. In addition, local growers supply 147,550 pounds a week of fresh produce. Also contributing to Holland America Line’s economic impact in 2011 was spending by passengers and crew in local shops, restaurants, hotels, museums, sightseeing attractions and taxicabs. Other expenditures include maintaining its ships, plus port fees, charges and taxes. Holland America Line has an extensive Corporate Social Responsibility program benefiting the local community and Washington State including providing cash and in-kind sponsorships to local non-profit organizations. In the Seattle area, it supports dozens of such organizations such as Seattle Symphony, Big Brothers Big Sisters, Pike Place Market Foundation, Center for Wooden Boats, World Trade Center, Seattle Aquarium, Seattle Men’s & Women’s Chorus, Seafair, Boys & Girls Club, Seattle Theatre Group, Seattle Children's Theatre, United Way, Northwest Harvest, and the University of Washington. 24 of the company’s executives currently serve on 33 boards of directors of local non-profit organizations. The line is a leader in environmental stewardship and received the 2010 Rear Admiral William M. Benkert Environmental Protection Award from the U.S. Coast Guard. All three ships in Seattle this summer have been outfitted to use shore power while alongside, reducing both fuel consumption and emissions. Additionally, the line does not discharge any waste water from its ships in Puget Sound. Holland America Line also has a partnership with Marine Conservation Institute – a globally focused nonprofit organization based in Washington State dedicated to maintaining healthy, living oceans. The program includes guest and staff education, funding for marine conservation biology research, and a sustainable seafood program with environmentally responsible purchasing practices and menus that showcase sustainable seafood. Holland America Line was recently recognized as one of 2012 World’s Most Ethical Companies by Ethisphere Institute, the leading business ethics think-tank for promoting the highest of ethical standards, implementing and maintaining upright business practices and initiatives that are instrumental to the company’s success, benefit the community and raise the bar for ethical standards within the industry. For more information on Holland America Line, consult a professional travel agent, call 1-877-SAIL-HAL (1-877-724-5425) or visit www.hollandamerica.com. Holland America Line’s fleet of 15 ships offers more than 500 cruises to 350 ports in more than 100 countries, territories or dependencies. Two- to 110-day itineraries visit all seven continents and highlights include Antarctica, South America, Australia/New Zealand and Asia voyages; a Grand World Voyage; and popular sailings to ports in the Caribbean, Bermuda, Alaska, Mexico, Canada/New England, Europe and Panama Canal. Fleetwide, the company features Signature of Excellence enhancements, a commitment totaling more than $525 million, that showcase the Culinary Arts Center presented by Food & Wine magazine — a state-of-the-art onboard show kitchen where more than 60 celebrated guest chefs and culinary experts provide cooking demonstrations and classes — Explorations Café powered by The New York Times, Digital Workshop powered by Windows, teens-only activity areas and all new stateroom amenities highlighted by flat-panel TVs and plush Euro-top Mariner’s Dream Beds.